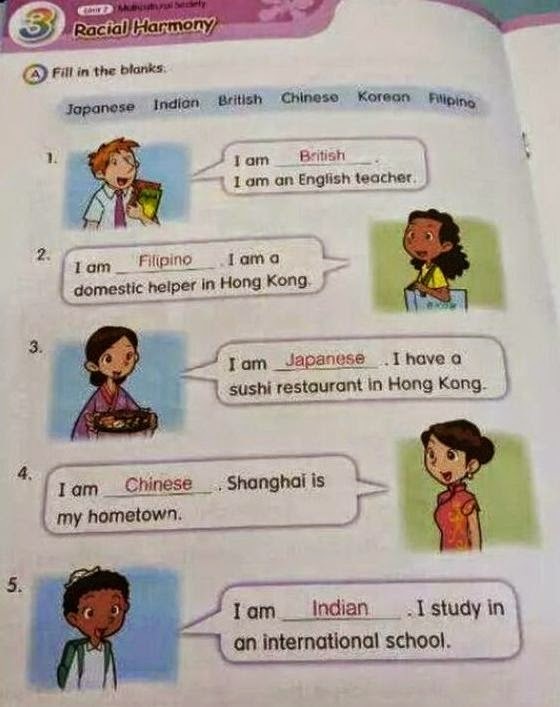 A textbook for primary schools in Hong Kong contains the following fill-in-the-blanks quiz. There are five entries to the quiz and 6 possible answers (Japanese, Indian, British, Chinese, Korean, Filipino). Apparently, the ones placed in the blanks below SHOULD be the correct answers. As expected, this photo is currently giving a lot of people headaches, Filipinos mostly. The Hong Wrong blog from where we first heard about this textbook says the photograph "is going viral amongst parenting, Filipino and teacher forums online." Le's be honest here. Stereotypes often reflect reality. They may not be accurate but they carry some weight of truth to them. In this instance, it's true that a huge part of the Filipino population in Hong Kong are domestic helpers. But it's also true that there are Filipinos who are students in an international school there or who are English teachers. The same can be said about the other nationalities. A Japanese can be studying in an international school. A British can be the owner of a sushi restaurant. The quiz is wrong on many levels. First, the title of the task says Racial Harmony but it's promoting racial discrimination. Defining people from various countries based on stereotypes and then teaching them to kids creates an environment wherein the kids are forced to develop preconceived notions about these nationalities. Imagine five students in a Hong Kong classroom. One is British, one is Filipino, one is Japanese, one is Chinese and one is Indian. Coming across this Racial Harmony quiz, all the students will feel good (or proud even) on how they were defined except of course for the Filipino student who was defined as a domestic helper. This is not to say that being a domestic helper is not an honorable job. In conclusion, this Racial Harmony quiz promotes racial stereotyping among children. It encourages discrimination. An interesting part of this story is that stereotypes in text books and teaching materials in Hong Kong has been going on for a long time. Here's a 1999 report about this problem.